Size: 3 1/4" x 3 3/4" x 2"
Description: This is a Dr. Strange Christmas tree ornament by Hallmark. 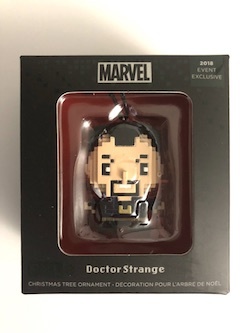 It is a pixelated version of Dr. Strange with POPMINDED printed on the top and a Nerdy Nugget info box on the back that gives some history on Dr. Strange and the Defenders. The figure itself is about 2" tall and was a SDCC exclusive.